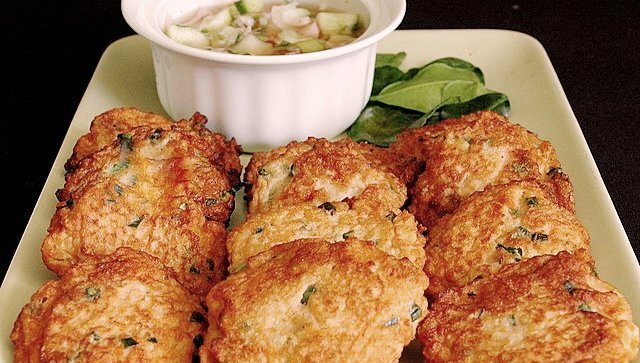 Unfortunately, opportunities for cooking these delicious fish cakes do not happen often, good reef fish being the price it is. When Dad and I went up to the Bunkers with Nikki and Bruce Phillips on the old ‘Arbitrage’, I went prepared (even though Bruce drew the line at my wok.) My chance came one day when we caught nothing but Red Hussars, a good eating fish with very little keeping ability. Red Hussars do not freeze well, so it is a matter of eat now, or use for bait. When I announced that I was making Red Hussar Thai fish cakes for lunch, I was banished from the galley and told to prepare them on the bait board. So I did. Nobody objected to eating them, though. Remove any skin and bones from the fish and cut into pieces. Place in a bowl of a food processor with all of the remaining ingredients, except the oil for frying. Process for 30 seconds or until just mixed. Do not over-mix. Refrigerate mixture for at least an hour or until cold. With damp hands, shape the mixture into patties, approximately 5cm in diameter. Heat oil in a wok or deep frying pan and fry the fish cakes, a few at a time, until crisp and golden brown, turning once. Drain on absorbent paper and keep hot in a very slow oven (120C) while cooking the remainder. Serve with Cucumber Salad. Quarter the cucumber lengthways and using a small spoon, scoop out the seeds from each quarter. Slice finely with skin on. Place sliced cucumber in a bowl with the shallots and chillies. Mix together the sugar and hot water add the vinegar and fish sauce and pour over the cucumber mixture. Refrigerate for 30 minutes before serving. Garnish with chopped coriander. I really enjoy good Thai food and your recipes sound great. Most of the recipes that are “thai based” like the red duck curry are a bit of a mix of authentic vs what’s at hand. My mum (and I) very much believe in the Thai principle of all meals containing sweet, sour, hot and salty and where she/we (often we created them on a Thursday girls night), we always applied this rule. Sounds like the way I cook. Thursday girls night sounds like fun. Those sound and looks absolutely incredible. Thanks for sharing the recipe!